WE'RE BUILDING A TEAM OF FORWARD-THINKING PROFESSIONALS WHO ARE ON THE CUTTING EDGE OF THAT TREND. Join the fastest growing real estate brand in the United States! Tony Anderson started NextHome Gulf Coast with a commitment to do things different. You see it’s not just about transactions, it is about the experience. NextHome is a consumer centric brand and we are focused on delivering a positive customer experience. So, we have taken a fantastic brand with abundant tools and systems to assist our businesses and added our own special touches. It’s also about the agent experience. Achieving success as a Realtor is hard work. NextHome Gulf Coast strives to provide our associates with the training and resources necessary for success in an environment that promotes teamwork and rewards success. Competence – to effectively market properties and negotiate contracts to achieve our customer’s goals in their desired time frame. Be eager to learn new technology and marketing techniques that produce results. Honesty – in all circumstances. Communicate frequently and effectively with customers, agents and vendors instrumental in your transactions and business. Always remember, character is who you are when no one is watching. Integrity – placing the interests of our customers above your own at all times. Oh, and be ready to have some fun! Tony Anderson is owner and broker of NextHome Gulf Coast. His real estate experience includes that of an investor, agent, and broker. Over the years he has accumulated numerous industry designations (GRI, SFR, CDPE, CPRES, CNE, e-PRO, PSA) because he is passionate about the real estate profession and constantly seeks to learn and, in-turn, teach his team how to best serve their customers and grow their businesses. A Tampa Bay resident since 1997, Tony started his real estate career as an investor. As a licensed agent since 2005, he spent four years marketing and selling bank owned foreclosures and subsequently managed an independent brokerage. His experience has included everything from marketing luxury properties and waterfront homes to assisting financially distressed home owners to avoid foreclosure. Prior to real estate, Tony held management, finance and marketing positions in the telecommunications industry. He has over 25 years of business management experience. Tony’s goal at NextHome Gulf Coast is to maintain a positive, productive and supportive environment that allows our associates to prosper as they deliver quality service to our customers. Even with the latest technology and cloud based services, real estate is still face to face business. We want agents to maximize their time growing their business in the best way possible: by increasing face time with their clients. Agents have the option of working in one of our offices or virtual from any location. Our agents can access client information, create new listings, craft buyer offers, and much more at any time, from any place. With today’s technology, we are mobile, reachable and efficient. You don’t have to pay us to join our firm. We can’t believe this actually exists. Aside from referrals, in many cases, buyers and sellers find their prospective agents online. That is where you should be to greet them. Our programs assure your strong presence online. Our technology, advertising, marketing, training and integrated systems are all part of the package. Our customer relationship management (CRM) system is the hub for a suite of technology services including an open house conversion, predictive analytics, automated testimonials, mobile lead capture, and artificial intelligence systems. Leverage technology and maximize efficiency through easy-to-use systems. Knowledge is power and essential to agent success. Our agents stay ahead of new technologies, consumer trends, transactional shifts and more through progressive products and training provided by NextHome and hands-on mentoring. On-demand, web based and live training on our programs and services. Communicate directly with a live NextHome corporate support staff person that is focused on responding promptly and accurately to your questions. Or, ask your broker! Design and branding created with consumers at the core. Connect and resonate with your clients through a fresh culture, enticing design and meaningful brand. Beautiful signage, high quality presentations, cloud CMA software, agent websites, drip email campaigns, DocuSign integration, mobile connect technology, and other collateral marketing materials at your fingertips with one single login. At NextHome your listings will syndicate to hundreds of different websites. The power of our National Listing Distribution program gives your listings unparalleled exposure to all key homebuyer web search sites and the best opportunity to sell your listings fast, for the highest price possible. Life is on the move and real estate happens everywhere. Transact, market, and execute your business anywhere, anytime. And to make it even easier, our technology, advertising, marketing, and training are all integrated … and part of the package. Experience a comprehensive platform and full set of easy–to-use services all in one place. Go completely paperless by using your own e-Sign and Transaction Rooms by DocuSign. Now you can go on vacation and complete your contracts remotely! Our state-of-the-art CMA system enables you to create stunning presentations, buyer tours, property reports and flyers in minutes. 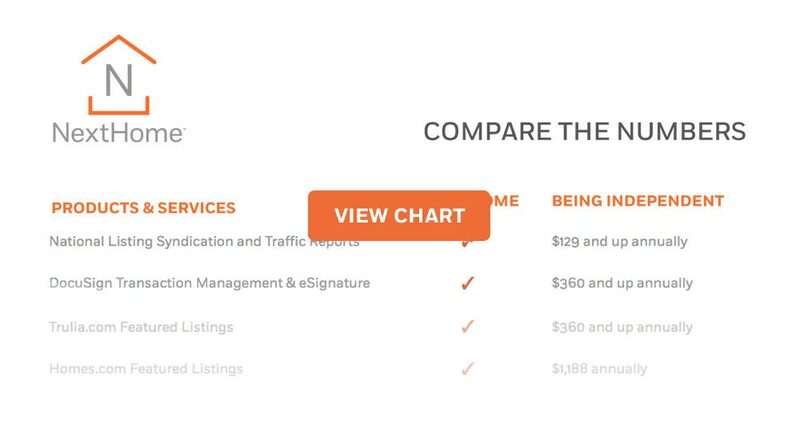 Arrive at your listing appointments with the most comprehensive data and impressive presentation tools. No more trying to figure out how to do this yourself. We’ve got you covered with easy to implement templates and how to videos. Get the website traffic you deserve with our fully integrated system. Our better commission splits, with caps, along with superior computer systems, vendor selections, and other services are all designed to substantially drive down the costs for agents to pursue their careers. We do not charge any fees. No desk fees, no technology fees, no supply fees, no website fees, no training fees…zero, zip, zilch, nada. We are about providing quality leads, not quantity or time-consuming leads. We offer a number of different network services that can be accessed through one hub including but not limited to CRM, SmartZip, Reach150, Artificial Intelligence (AI) Assistant “Luke”, HomeSpotter, Spacio and RealScout. When you join us, we provide you with your first order of company business cards reimbursed at your first closing. NextHome Gulf Coast has you covered at no expense to you. For any listing priced over $300,000 we provide a 360° Virtual Tour. Your clients are going to flip out the first time they experience this technology. It cuts down on the “tire kicker” showings and comes in very handy when marketing properties with tenants. We provide you with the very best signage for your residential listings. You just provide the Agent Name Rider that goes on top with your contact info. We even provide “Luke”, the French bulldog, signs to capture more attention than ever. Property Management services are available to your investor and seasonal customers through our management company, Property Squad. Nexthome Gulf Coast I feel is the best brokerage in the industry. Not only do we have cutting edge tools and technology, but we also have a broker who treats us like family. Tony is always there for us and doing things to help grow our business. At NextHome Gulf Coast, it’s not about how many agents we can get on board, its about the quality and character of the individuals that work with us. It’s about agents collaborating ideas to help all of us be successful and make a difference. It’s about staying on the cutting edge of our industry and providing a service experience that stays top of mind to our community and customers. I love being a NextHomie and plan on growing along side our NextHome Gulf Coast Offices all over Tampa Bay! From the moment I joined NextHome Gulf Coast it has truly been one positive experience after another. This company genuinely cares about its agents and is always quick to provide ample support and direction. Since joining, my business has flourished and I’m proud to be a part of a brokerage that places such value on its agents! When I made the switch to NextHome Gulf Coast Realty I immediately felt better about my real estate career. The leadership of management and comradery of the team provide a positive work environment. And I feel more energized knowing that I have the resources and support I need to be successful. NextHome Gulf Coast Realty has been very welcomed change in my real estate career. It was a smooth transition and the training has been great. They provide tons of agent benefits and have a great support team . With multiple office locations and online systems, I have everything I need to be successful. I am looking forward to a long and happy real estate career with NextHome. Our compensation model is simple and competitive. Based on experience and past production, compensation is all inclusive – we don’t nickel and dime you. In fact, we don’t charge any fees. You deserve to be incentivized for productivity and rewarded for performance. If you are committed to building a successful business, we are dedicated to providing you with the training, tools and resources necessary to ensure your success. We help you sharpen your skills, expand your knowledge and open doors. NextHome Gulf Coast Realty is committed to maintaining a motivating and supportive work environment. And we celebrate our victories together. We are not a discount brokerage. We believe that there are plenty of options for associates who are willing to cut their commissions in an effort to try to compete. We are not participating in the race to the bottom. Instead, we believe in offering tremendous value to our associates so that they, in turn, can significantly increase their value proposition. We are looking to partner with associates who are always looking for ways to add value to their service and enhance the customer experience. We are confident that NextHome Gulf Coast Realty offers the very best value for the full-service Realtor. NextHome Gulf Coast does it again! Our Palm Harbor location is now the #200 office to open in the U.S.
NextHome Gulf Coast opens the 100th NextHome franchise in the U.S.
Tony Anderson and a few members from our corporate office join together to celebrate the opening of the #100 office to open in the U.S.
​NextHome Gulf Coast is a pet friendly environment! These two pups had a blast on “Bring Your Pet To Work Day!” They were fetching leads left and right! Made with in Largo, FL. Servicing all of the Tampa Bay area.